TEMSA board members Butch Oberhoff, Keir Vernon, Jeff Mincy, Jonathan Sell, and Dudley Wait representing the Texas EMS industry before the Texas Legislature. 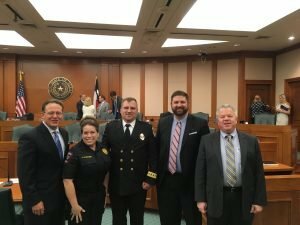 Texas EMS Alliance board members Dudley Wait of Schertz and Jonathan Sell of Booker provided testimony on EMS issues at today’s hearing at the Texas Legislature on the state’s EMS and trauma system. The House Public Health Committee and the House Appropriations Committee – Article II held the joint hearing.